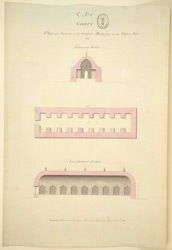 Pen-and-ink plan and sections of the Grand Magazine on the upper fort at Gooty, Andhra Pradesh by Thomas Fraser (1776-1823), c.1802. The fort stands on a rocky outcrop, 301 metres (989 feet) above the surrounding plain. It is approached by a path which winds its way up the steep sides of the rock to the citadel on the summit. The fort, built between 1509 and 1530, was once the stronghold of Murari Rao, a famous Mahratha warrior and ally of the British who joined Robert Clive at Arcot in 1751. The ruler of Mysore, Haidar Ali (c. 1722-1782) seized the fort in 1776 but in the Mysore campaign of 1799 it fell to the British. At the fort is a bastion overlooking a precipice where Murari Rao is said to have watched prisoners being thrown to their deaths on the rocks below.